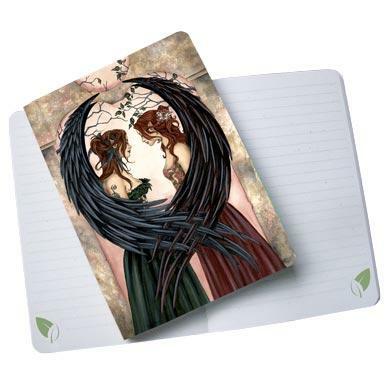 This Fairy Journal features the artwork of Amy Brown. It has 160 smythe sewn pages. That means it has a "lay-flat" binding. 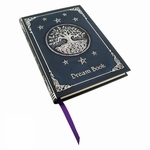 It is made of 100% post consumer recycled pages and is printed with eco friendly inks. It also includes a free matching book mark. The gorgeous artwork features a pair of fairy sisters. They have black feathered angel wings, and stand face to face. Each has auburn hair, and one wears a dress of dark, hunter green, while the other is clad in maroon.